Take advantage of all those seasonal berries and a few minutes of free time and make this Instant Pot Mixed Berry Jam. My new favorite way to liven up breakfast and even dessert. As you can probably tell, I’m still obsessed with the Instant Pot over here. Although I do imagine I won’t be using it as much as it warms up outside and grilling season is in full force. But for now I’m still majorly into it and excited to share my newest creation. My kids, like most out there are lovers of peanut butter and jelly sandwiches. They go through phases where that’s all they want for lunch for a month straight then they are over them for a while and inevitably they return to the obsession again. When we’re in the throes of PB&J devotion we go through lots of peanut butter, jelly and jam. I try to avoid too much sugar because my kids become different humans when they eat too much of it. Trust. It’s not pretty. And of course all of the lower sugar, organic, fancy pants jellies and jams are expensive for how fast we go through them. So with berry season and PB&J obsession both in full force I decided to make my own. In the instant pot. It’s way better than standing over a hot stove for 30 minutes, stirring and babysitting. BUT if you don’t have a pressure cooker you can still make this on the stove. 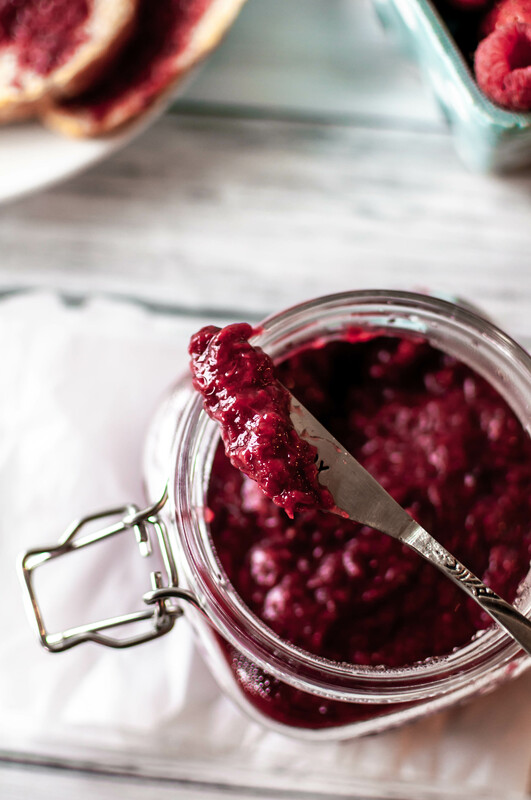 I used strawberries, raspberries and blackberries in this Instant Pot Mixed Berry Jam but you can use whatever berries you love or whatever is on sale. You can also add more sugar if your berries aren’t as sweet or if you like a sweeter jam. This stuff tastes so fresh and seasonal. And friends, if you thought this was healthy-ish you were right but stick around because I’m sharing something delicious and decadent using this goodness in a couple of weeks. You won’t want to miss it. Mix all the ingredients together in the Instant Pot and let stand to mascerate for 10 minutes. Place lid on top, seal vent and set to manual for 4 minutes. Allow it to naturally release for 15 minutes. Remove lid and mash as much as you like. If you prefer it super smooth you can puree it at this point then place back in the Instant Pot. Turn to saute mode and cook for 10 minutes, stirring often, until thickened. Store in an airtight container in the refrigerator.